WP Rocket Review: Is It Worth It? If you’re reading this because you need to increase the performance of your WordPress website in 2019 then you’ve come to the right place! 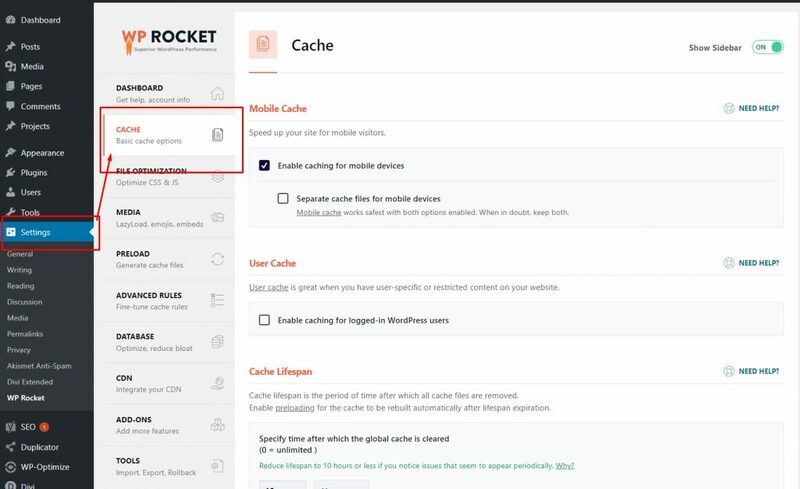 In this review of the caching plugin WP Rocket, I’ll show you how the WP Rocket can improve the performance of your WordPress website and more importantly help you set it up right away. By the time you finish reading this article, you’ll see a significant improvement in the performance of your website just like how I did! In fact, the WP rocket caching plugin improved my website performance by over 27%, which is pretty dang awesome! Do you really need a caching plugin? Caching is what a mechanic is to a car. 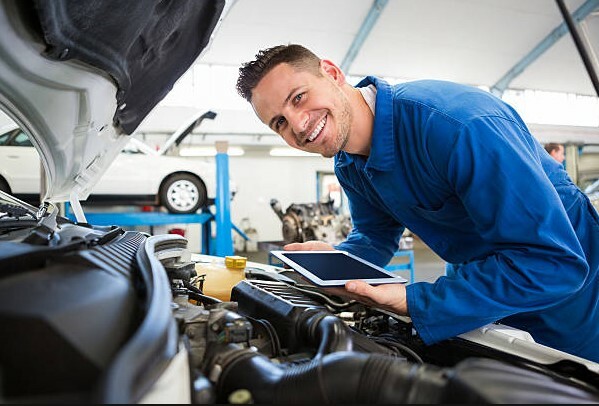 However, in this case, it is a mechanic that works around the clock on maintaining the performance of your website. The reason I titled this article “The secret sauce of every successful WordPress website” is because high performance is the reason I have been able to generate more traffic than my competitors. In fact, it is very essential to have a fast loading website (more on this later) for better rankings and more importantly better user experience. In fact, every successful internet entrepreneur has an extremely high-performance website as they know it’s important to keep what’s under the hood clean for maximum performance. What would your visitor prefer? A website that loads quick or one that takes time to load or one that takes time a lot of time to load? This also has a direct relation to conversion rates as a visitor that can access your website faster has a better user experience and ultimately more sales. I would not get into the much technical aspect of WordPress caching and what you should know here is: Having a cache plugin on your WordPress blog is essential. 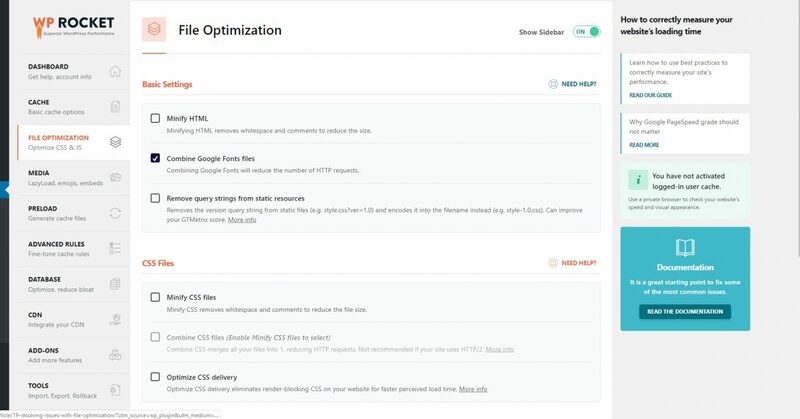 Now there are various cache plugins out there (Free and paid) and picking the right one is important, as it will save you from the headache of configuration, it will make your WordPress blog highly optimized for speed and performance. Unlike old days, now WordPress is a big commercial market and all plugin developers are in a race to convert their free plugins into a product. For example, one of the most popular cache plugin W3Total cache started offering Pro features/ support which unlocks many advanced features and recently (One year back) another paid cache plugin call WP-Rocket entered into the market and this was probably first WordPress cache plugin in the market to be released as a premium plugin. Before I dive into the nitty-gritty and review WP Rocket’s features and show you how the interface is I first want to show you how this plugin actually is making a difference in my websites. It’s a highly visual website with some custom Jquery animation so it’s much bigger than a normal website however what you should be paying attention to is the difference the plugin actually made. Basically, WP rocket reduced my page speed time from 4.5 to 3.1 seconds! In case you don’t have a calculator with you, that means WP Rocket made my test website load about 20% faster! Moreover not only did it improve the raw page load time by 0.9s, but it also shrank the file size by an extra 6% and finally reduced the number of HTTP requests from 50 to 44. While these number may look small it makes a HUGE difference in conversions. If your website generates 100K searches a month stats like this mean your visitors are now able to reach you 20% faster and have a much better experience! This, in turn, would lead to a significant increase in sales. Whenever I recommend something it is only after actually using and testing it myself which is why I if you’re looking to increase the performance of your website keep reading and trust me you WILL see a difference! *For more information on the test, my test site was using the Divi theme and a Divi Library template on the tested page. A quick glance of the WP Rocket depicts it is probably a caching plugin, but to be frank it actually performs a lot of smaller key optimizations that go beyond simply caching. I won’t lie there are other caching plugins do the same functions as well ( W3 Total Cache for instance) however what’s different about WP Rocket is that it doesn’t really require any configuration! If you’ve ever tried some of the other caching plugins like W3 Total Cache you are already familiar with the horrendous configuration required for it to work well, which is why an easy configuration is actually a pretty important differentiator. If you are one of those that do like getting their hands dirty and configure things you can! What I mean by doesn’t really require any configuration is it’s entirely optional! With WP rock you can simply install and activate it onto your website and you’ll see a significant difference. There’s only one catch WP Rocket, unlike other caching plugins, isn’t free. It costs about $49 annually for a single website license going up to $249 for unlimited websites. Thus it can get expensive so it’s important to know what it is and how it works to get the best out of your investment. WP Rocket is essentially a page caching plugin its main purpose is to configure your website automatically without having to do it yourself and waste time with some complex configuration. Images are only loaded as your visitor scrolls down the page, improving the load time of the page. YouTube, Facebook, Yahoo, and other major websites are using this technique. Now yours can too. I am on the latest (9/10/18) 4.9.8 version of WP Rocket. It is the brand new and redesigned interface, so if you read an older WP Rocket review before this, you might notice that things look a little different. 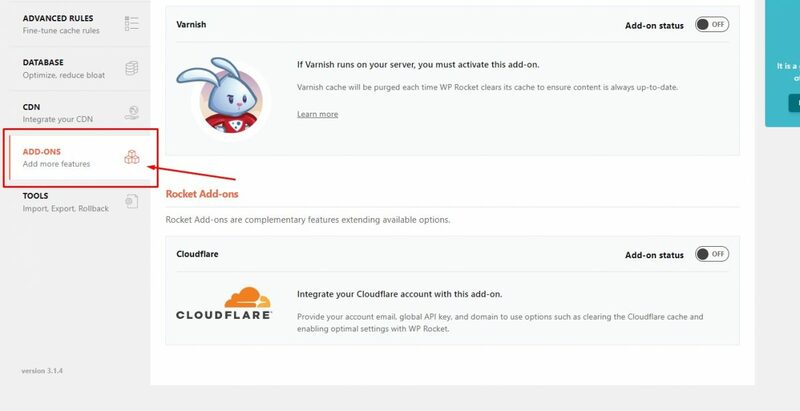 As soon as you activate WP Rocket, it will automatically implement the features that I listed above to start speeding up your site… which it makes quite clear in the interface. So here’s good news you can actually get the results I got above by just reading further and following along. If you already haven’t installed WP Rocket I recommend you try out the free trial here. Do note If you already have another caching plugin like W3 Total Cache on then I advise you to disable it and take further measures to completely remove it. Note: Do make backups in case you want to go back to the W3 total cache. Step 1: First, delete all cache and deactivate the W3 Total Cache plugin. Step 2: Delete the W3 Total Cache plugin from the Wp-content/plugins folder. Step 4: Check the .htaccess file; if you see any code added by W3 Total Cache, remove it. Step 5: Delete advanced-cache.php, db.php, wp-total-cache-config.php, and delete the entire w3tc folder from the Wp-content folder. Step 6: Also follow this guide clean options plugin to delete orphan tables created by the W3 total cache plugin. PRO TIP: You should a test and document the performance of your current website to compare it later after using WP Rocket. Do I really need to do is? The idea is to remove all files related to W3 Total cache and test the site performance with the WP-Rocket cache plugin. OK so let’s dive into how I got this score. Just follow along and you’ll get the same results: I will also be briefly explaining each element so as to tell you how each area affects the configuration. I recommend: Leaving these as defaults. Include/exclude mobile users from seeing cached pages. Include/exclude logged-in users from seeing cached pages. Enable caching on HTTPS pages. Choose how long a page remains cached before the cache gets cleared (the default is 10 hours). I recommend enabling as many of these settings as possible because some of the settings for CSS or JS might cause issues with your site (this isn’t WP Rocket’s fault though as it’s always a potential issue with minification/concatenation). Minification – This will shrink the size of your site’s code by removing any unnecessary characters (like whitespaces) without causing any change in the functionality. Concatenation – reduces the number of files on your site by combining multiple CSS/JS files into one. Eliminate render-blocking CSS/JS (PageSpeed Insights is notorious for yelling at you about this issue). Combining Google Fonts files (helpful if you use multiple Google Fonts on your site). Remove query strings from static resources (this one won’t have a big effect, but it can improve your GTmetrix score if you care about that). In the Media tab, you can enable lazy loading which will basically do exactly that reduce loading images and/or videos, as well as disable WordPress emojis and embeds. One feature that’s pretty nifty nice the option to replace YouTube video iframes with some static preview image. Without preloading, your site only “builds” the cache for a page when someone actually visits the page. That means the first visitor after the cache lifespan expires doesn’t see the cached version (Since the cache hasn’t been built yet). 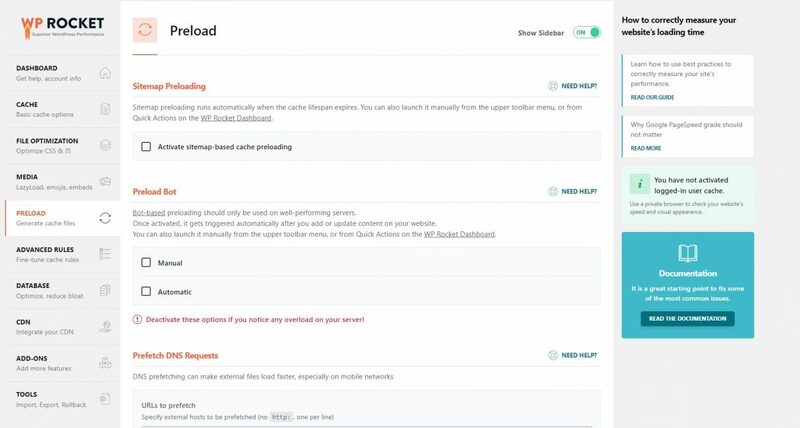 Cache preloading lets you ensure all visitors see the quick-loading cached page by “warming” the cache yourself, rather than waiting for someone to visit the page! Sitemap preloading – preloads your cache based on all the pages in your sitemap.xml file. It’s low impact, but the disadvantage is that it doesn’t cache newly published or edited posts. Preload bot – automatically crawls URLs after you publish/edit a post to ensure that newly edited/published content is also preloaded. The only downside is that it’s a little bit more resource intensive, which might cause issues on “weak” web servers. What I recommend: If you’re a just casual user, you probably don’t need to look at this section. This is a section more for the advanced users who want to customize further and get their hands dirty. 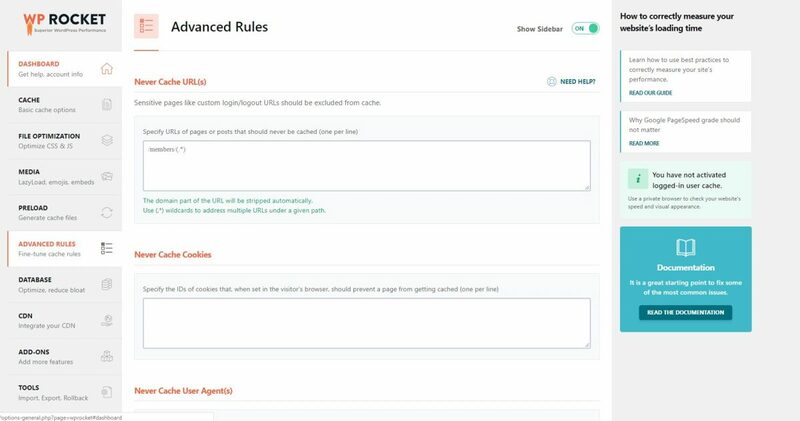 The Advanced Rules area gives you the ability to gain complete control over how the caching functions for specific URLs, cookies, user-agents, etc. Or simple specify certain cookies or user-agents to exclude from caching certain pages. What I recommend: Whilst your site is aging you need to routinely visit the plugin and clean up your database by clicking the cleanup button in the plugin. This is a bit of the extra minor features that WP rocket does other than just caching. 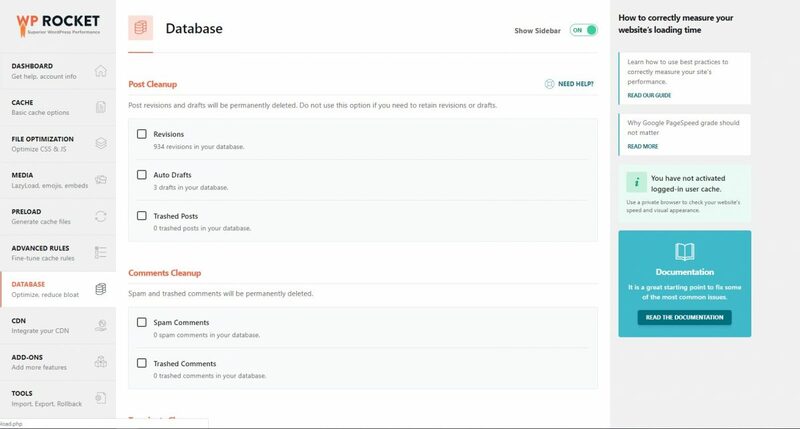 The Database area helps you clean out all that unnecessary junk from your database with a single click of the button. To be frank I find this to be the least exciting area of WP Rocket because there are plenty of free plugins will do a great job in cleaning your database. But I guess what’s better here is WP Rocket eliminates the need for you to install a separate plugin. So for the final part of this article although all this may technically sound pretty good most of you guys are probably wondering. Is it really worth spending to get WP Rocket over other free caching plugins? BJ Lazy Load: for lazy loading etc. Really the question you should be asking your self is whether you REALLY want to take out the time to do that instead of focusing on the more important stuff building content and links because It will take you a lot more time to get everything configured. Simplify your life by eliminating the need to use having to install multiple plugins when you can just use WP Rocket that uses one. With WP Rocket everything is legit in one place so you don’t have to do anything! also, save a whole bunch of time because you now don’t need to configure any of those free plugins and work out some compatibility issues. 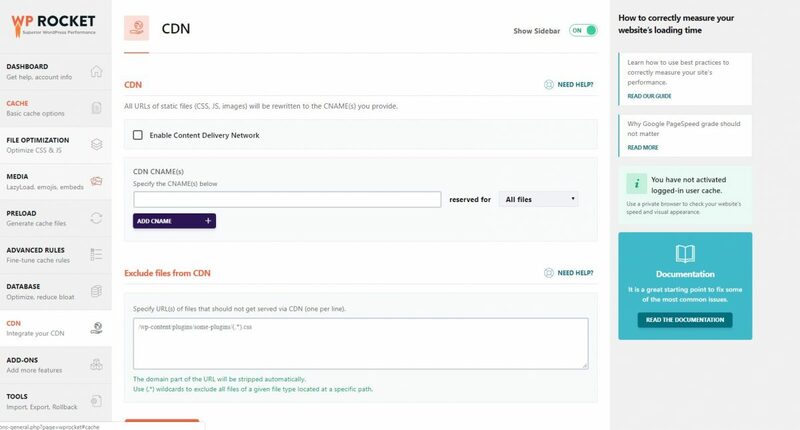 And you’ll also get access to a dedicated support team from all around the world that will help you when you’re working on something technical like performance optimization. Remember sometimes what is good is not cheap and what is cheap is not good. The first factor I look for before getting a plugin is whether it is paid for then I know there is a reliable and dedicated team constantly improvising and support its functionality. So instead of wasting that $49 at some club over a weekend invest it in WP Rocket for more peace of mind and more importantly more conversions.